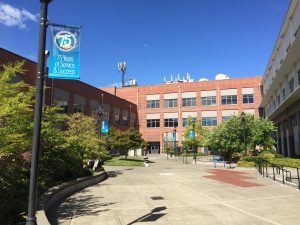 Bates Technical College is a beautiful college located in Tacoma, Washington, approximately 35 miles south of Seattle and 30 miles north of the state’s capital city, Olympia. The college operates on three campuses, with over 600,000 square feet of classrooms, shops, meeting rooms, and offices. TSI is proud to announce the award of their upcoming project to expand their VMS; camera replacements and addition to their current system. NEW! As of 2017 A repeat customer – Customer Satisfaction at its best! After many years serving the Oneida Casinos, we have seen the importance of building strong relationships with our customers. TSI once again has been awarded the project to replace their outdated system across their seven properties. This is a great example of how fanatical customer service, loyalty and hard work pays off. We look forward to continuing our relationship with Oneida Casinos for many years to come. With this expansion, Oneida Bingo and Casino is adding a total of 176 1080HD IP cameras. The majority of the new IP Cameras will be used over the table games while others will be used to cover the general gaming areas and new sports bar. Oneida Bingo & Casino will now be running a hybrid system using both analog and IP cameras. Oneida has been a long time standing customer of TSI and we are looking forward to working with them on their new expansion project. 2011 – Where it all started! TSI was awarded the project of replacing Oneida Casino’s obsolete digital recording system. As a cost saver, the design was to incorporate as much of their existing Pelco equipment as possible while providing them a complete new 1600 channel digital recording solution. The Oneida property is unique in that they currently operate six of their sites from a central location. TSI was able to simultaneously install the new digital recording system at all sites. The installation also included a new console with a state of the art digital monitor wall. TSI was able to maintain simultaneous operation of their old and new surveillance systems until the final cutover was complete and Oneida Gaming Commission gave their approval. Not only was the installation a success, but TSI was able to decrease Oneida’s footprint for their entire system and power consumption. At this beautiful property located in Saint Joseph, MO, Technical Security Integration, Inc. successfully completed the replacement of their outdated digital recording system, which also included PTZs rewiring. The project developed smoothly, and it was finished in a timely matter. 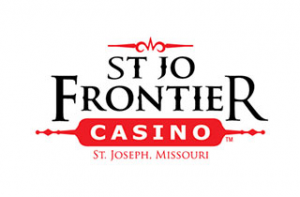 Mark Meyer and his team at Jo Frontier Casino appreciate the quality and efficiency that went into this TSI project. NEW! TSI is proud to announce that as of this new year 2014, we have been awarded the Arizona Charlie’s Decatur Hotel & Casino project in Las Vegas, Nevada. This property is owned by American Casino & Entertainment Properties, as is the Stratosphere, which is also a proud TSI customer. As a testimony to our impressive customer service and superior work at the Stratosphere, Arizona Charlie’s Decatur has also chosen TSI to be their trusted integrator, and to perform their upcoming system upgrade. For this project, we will be installing a new 450 camera digital Genetec system, with 20 IP cameras over table games. More information on this project coming soon. TSI proudly designed and performed a complete surveillance and security room remodel at The Stratosphere Hotel & Casino on the Las Vegas strip in Nevada (an American Casino & Entertainment Property). 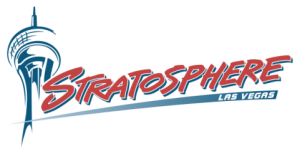 We replaced the Stratosphere’s legacy system of VCR recording with a brand new Digital Recording Solution that is responsible for recording over 1,500 cameras. The Stratosphere’s newly installed hybrid solution integrates a Pelco 9700 matrix switch to convert analog video streams into h.264 digital video, giving the Stratosphere the most cutting-edge and reliable surveillance department on the world famous Las Vegas Strip. Room tours are made available to casino surveillance and other top security professionals by contacting your local TSI representative. TSI has had the pleasure of working with Stanford University to help increase their level of security by installing an access control system in multiple buildings throughout their campus. This was the first step in an effort to heighten security which will eventually lead to access control systems in roughly 800 buildings throughout the facility. 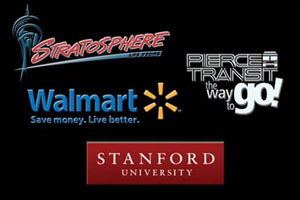 Pierce Transit has been a loyal customer of TSI for many years. TSI has installed a complete CCTV, access control, and IDS system for Pierce Transit, providing security and coverage spanning across buildings that are miles apart. TSI maintains all aspects of these systems by way of repairs, updates, programming, and new installations as necessary. TSI also maintains and tests their Wheel Lock EWS system and TOA panic system. 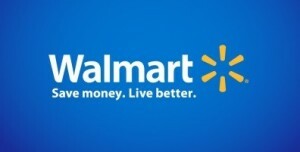 TSI was selected to be Wal-Mart’s trusted integrator for the complete installation of an Access Control (e-Data) system for both their Hanford and Las Vegas distribution centers. TSI also maintained their systems when needed, providing prompt and reliable service, as well as performing maintenance and repair needs for both facilities. TSI had the privilege of performing Phase I of the recent Red Hawk Casino surveillance system renovation. This project upgrade replaced their previous 4-year old system with a new Genetec VMS platform solution, consisting of an open architecture design. This new set up included removing the existing analog matrix and upgrading them to a complete virtual matrix consisting of nearly 1500 channels. It has been a pleasure working with the Red Hawk Casino staff and we look forward to continuing our relationship with them. TSI’s tradition of expansion throughout the US casino surveillance market continued in 2010 when we entered into a partnership with the 4 Bears Casino in North Dakota. 4 Bears converted their legacy system of VCRs into a brand new, 350 channel hybrid digital recording solution, optimizing both pre-existing analog cameras and 85 brand new HD IP cameras. Having visited all 5 casino surveillance departments in North Dakota, we are delighted to say that TSI is responsible for installing the newest and most cutting edge surveillance network in the state of North Dakota. NEW! For the new year, 2014, TSI has been chosen to revamp 4 Bears Casino’s old VMS surveillance system with a new Genetec VMS system. TSI was awarded this project due to the long lasting relationship we have shared with 4 Bears. We are replacing all of the servers and encoders to allow for the new Genetec system. This new system will be comprised of both analog and 1080HD IP cameras, which will also tie into their POS system and access control. TSI is happy to continue this relationship with 4 Bears and values them as a loyal TSI customer.